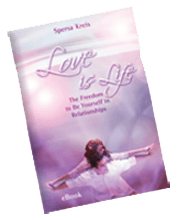 Singles and couples who are interested in creating a deepening trust and intimacy with a partner and would like to grow in relationships might get inspiration from this book about how to move on the path of love. It’s for those who are interested in the art of love and searching for a life in depth, integrity and truth. In a space free from expectations the reconnection between the heart and sexuality can happen. We start to understand how to use the polarity of female and male energies to get in touch with our own inner truth. Everyone has their very own individual way of coming closer to the ultimate truth and this book talks about the experiences while walking on the path. It is written from the perspective of the authoress and describes her individual process during the five years she lived as a resident at the OSHO International Meditation Resort in India. The tantric way is to accept every situation in life for transformation: nothing is excluded but everything is included. I completely immersed myself in this world that you have described and was gently carried by your soft, flowery language, which so vividly portrays your stay in Pune! I immediately felt like leaving everything behind and venturing into something similar in my life. I marked many passages, either because I agree with the content and find the choice of expression to the point, or because I suspect a truth the content of which I still do not fully understand, but someday hope to grasp the realization through further life experiences. I love your descriptions of how you have experienced intimacy, or what prevents couples from living it.